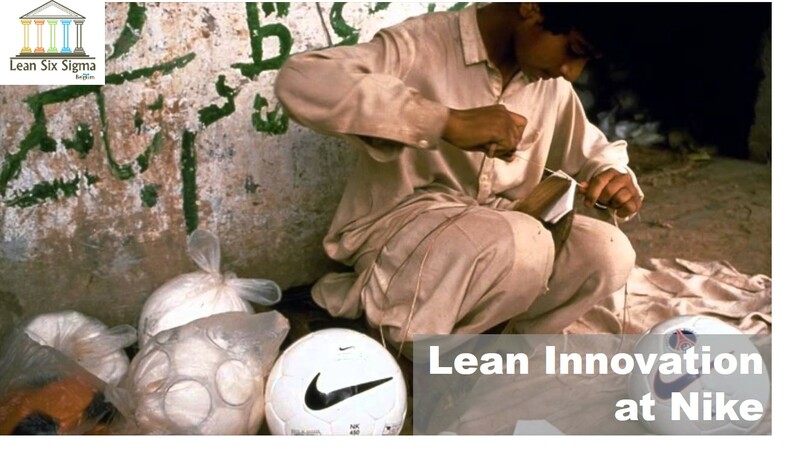 How did Nike integrate humanity in its business thanks to Lean innovation? In the 1990s, Nike, one of the premiere shoe manufacturers in the world, worn by the greatest names in sports from Michael Jordan to Tiger Woods or Maria Sharapova, became a poster child for lack of corporate responsibility. The Nike product has become a synonym for slave wages, forced overtime, arbitrary abuse and was facing weak demand and unrelenting criticism. In the beginning, the brand denied responsibility for any malpractice that might have taken place in its contract factories. However, at the end of the 1990s, the global boycott campaign of Nike was so impactful that the “swoosh” brand didn’t have any other choice than to recognize doubtful child labour issues and offered to visit the contract factories in Southeast Asia. To achieve this, it developed a partnership with the International Youth Foundation in order to conduct an anonymous survey among the 67,000 female workers in Nike contract factories. The relationship with the International Youth Foundation was very helpful. As a result, Nike benefited from a huge body of data and was able to identify a number of ways in which the working conditions at the factories could be improved. Amongst concerns, the pain points were delivery time, product quality, working conditions, and manager-worker relationships. Nike began to secure commitments from longstanding suppliers to implement a Lean innovation-based transformation. The term “Lean” was first coined to describe The Toyota Way management system, which is built on two pillars: Respect for People and Continuous Improvement. Based on this, NIKE’s culture of empowerment model is three-pronged: attract, develop, and empower. Most importantly, the people of NIKE, Inc. are seen as its ultimate value stream. By implementing a culture of empowerment that employs continuous improvement (CI) to deliver high-quality products, on time, at a low cost, Nike could incentivize its contract factories to improve the working conditions, reduce waste and inefficiencies, and safeguard employee satisfaction. Nike further developed a partnership with the Fair Labor Association to create performance indicators and launched the Sustainable Apparel Coalition with the US Environmental Protection Agency and other manufacturers. No other capacity-building program in the textile industry integrates as such HR and support of lean manufacturing, addressing both the needs of factories and workers, as well as the business. The transformation to Lean innovation and manufacturing was a huge commitment for the contract factories and resulted in a new standard of factory self-governance. How to measure the environmental and social footprint of a complex supply chain? To ensure everyone is performing at NIKE‘s standards, the company developed a scoring system for their contract factories ranking them from gold to silver, bronze, yellow or red levels. The Manufacturing Index (MI) in use assesses each factory in terms of lean, labour, health and safety, energy and carbon, and sustainability. This system gives environmental and human resource management performance equal weight alongside business metrics. Nike’s goal is to bring all factories to a bronze rating – their lowest acceptable level – or above. A bronze rating reflects factory compliance with Nike’s Code of Conduct and Code Leadership Standards, which are designed to protect the rights of workers and create a safe working environment. Any factory that reaches silver or gold demonstrates an additional commitment to progressively embed Lean innovation and performance management systems. Nike : the new world leader in Lean innovation? 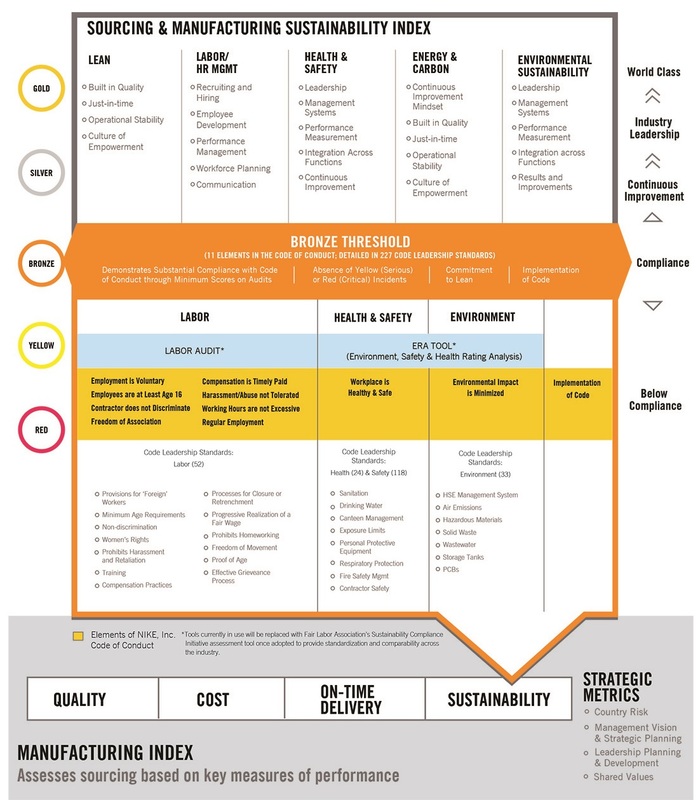 Nike aimed at creating an optimized production process that reduces impacts, eliminates waste, enables skilled and engaged workers to drive quality and productivity, and that is strategically led by managers who see value in an empowered workforce. In targeting these high requirements, Nike doesn’t leave the partner hanging dry. It actually spends time, energy and resources helping the contract manufacturing partner raise the bar in all areas of their manufacturing and reach new standards through various incentives. For example, the brand requires partners below the bronze level to pay for 3rd party audits, while partners above the bronze level are rewarded with audits paid by NIKE. On top of this, just two years after certifying their first Lean manufacturing line, the factories improved their score by more than a half grade on their audits compared to those who had yet to adopt a Lean line. This accounted for a 15% reduction in noncompliance with labour standards such as wages, benefits, and time off. As part of its efforts to promote Lean sustainability and disruptive innovation, Nike is fully behind the so-called “circular economy” concept, which focuses on re-use and sustainability management across the full product lifecycle. Nike envisions a transition from linear to circular business models and a world that demands closed-loop products, designed with better materials, made with fewer resources and assembled to allow easy reuse in new products. This involves up-front product design, with materials reclaimed throughout the manufacturing process and at the end of a product’s life. Nike is re-imagining waste streams as value streams, and already its designers have access to a palette of more than 29 high-performance materials made from its manufacturing waste. Already, materials left over from producing Nike shoes are being reborn as tennis courts, athletic tracks and new shoes. To source 100% of products from contract factories meeting the company’s definition of sustainable. To have zero waste from contracted footwear manufacturer sent to landfill or incineration without energy recovery. To create products that deliver maximum performance with minimum environmental impact, seeking a 10% reduction in the average environmental footprint and an increased use of more sustainable materials overall. To reach 100% renewable energy in owned or operated facilities by the end of 2025. It is not enough to adapt to what the future may bring. We are creating the future we want to see through sustainable innovation. Sustainability: the new Lean 2.0? Through being creative and strategic in developing Lean innovation and transformation techniques, Nike pursued systemic change to improve corporate social responsibility and the results speak for themselves. In less than a decade, the brand went from being the primary target of an anti-sweatshop campaign to becoming an industry leader in sustainability and corporate social responsibility. Nike did not only make use of traditions, such as the culture of empowerment model, but also revolutionized how it interacts with their global partners to become today’s one of the most Lean manufacturers in the world. As for the previsions for 2017 and beyond, there is no doubt that sustainability will become the new Lean.